CHRIS MONTGOMERY TTN The new Barnes Foundation building sits at 2025 Benjamin Franklin Pkwy. The building will house the Barnes collection, opens privately Saturday, May 19, and to the public May 25. Though not part of First Friday, the Barnes Foundation will open May 19 and remain open for 56 hours Memorial Day weekend. Though the event is not technically part of May’s “First Friday,” art enthusiasts only have to wait two weeks after it for the grand opening of the new Barnes Foundation location in Philadelphia. The Barnes, most famous for its collection of impressionist art, had been located at the former residence of Dr. Albert C. Barnes in Merion, Pa., for nearly 90 years. The old location will now be dedicated to archival materials and a horticultural program, with the Barnes’ new building along the Benjamin Franklin Parkway housing the great collections. Graduating senior Kelley Stone has seen the Barnes Foundation make its transition from Merion as an employee of the museum. The art history major with a minor in ancient Mediterranean studies has recently been employed by the museum full time as a visitor’s service assistant, and was able to see the move in progress the semester before she studied abroad in 2011. “My last week there they closed the entire second floor, but after that it was hectic because of the countless preparations they had to make,” Stone said. The big move for Barnes has been the subject of controversy since the decision to build a new building for the collections along the Parkway was made in 2008. Former visitors to the Merion location were attached to the idea of keeping a museum outside of the city. 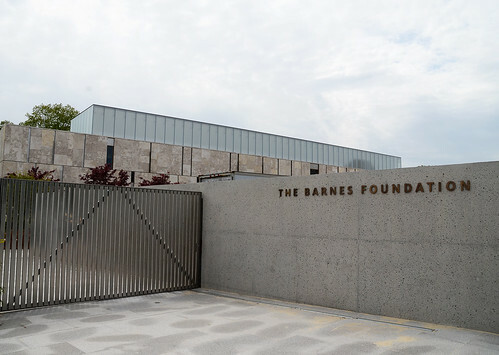 But the private opening of the Barnes Foundation on Saturday, May 19, will prove to demonstrate the city’s commitment to Albert Barnes’ original vision for his collection. When asked what the new building does for the collection, Stone gave more insight into why the move happened and what the new building does for the new, city visitor. The new building of the Barnes Foundation will now allow its collection of Picassos, Matisses and Van Goghs, among others, to share the same stretch as the Franklin Institute, the soon to reopen Rodin Museum and the Philadelphia Museum of Art. And in celebration of its opening, the public opening weekend of the Barnes from May 26 to 28 will be free to visitors. For those eager for some good art before the opening of the Barnes, here are some shows focused on paintings with opening receptions on First Friday, May 4. Gallery: Arch Enemy Arts, 109 Arch St.
Gabe Tiberino is a mural artist from Philadelphia, and when he was 16 was known as the youngest lead artist of the Mural Arts Program. “West Looking East” looks into street experiences and is concerned with people, especially locals, and how they deal with art as part of their world through acrylic and oil paintings. Gallery: Little Berlin, 2430 Coral St.
Peep features artists from New York City, Los Angeles, Chicago, Dubrovnik, Croatia and Philadelphia. The approach of the paintings is emerging from hiding places and finding surprises. Ries argues that students should explore Philadelphia’s various museums. How to leave the hustle and bustle of Philadelphia without taking a step outside city confines. Fashion photographer Scott Schuman and blogger Garance Doré hosted a book signing at the Barnes Foundation for Schuman’s book, “The Sartorialist: Closer,” on Oct. 13.